In our age of western medicine, the society has turned away from the natural health remedies that were greatly used by our ancestors. We often rely more on the modern chemically produced pills than all natural traditional medicine. Honey is much sweeter than sugar and is far better for you. Honey is essentially a highly concentrated water solution of two sugars, which our bodies break down easier and faster. Because honey is low on the Glycemic Index, it is gradually absorbed into the blood stream. Honey also has its effect on weight Loss which makes me mostly excited! Simply drink warm water with lemon and honey on an empty stomach. Did you know that though honey has more calories than sugar, honey when consumed with warm water helps in digesting the fat stored in your body? Restores eyesight. Mix 2 teaspoons of honey with carrot juice and consume regularly. Counters pollen allergies. Take a teaspoon of raw honey a couple of times a day starting a few months prior to allergy season. For hangovers. Mix 15ml of raw honey with 80ml of orange juice and 70ml of organic yogurt. Honey and cinnamon can help with Arthritis. Mix one part honey with two parts of luke warm water and a teaspoon of cinnamon. Massage the mixture on the itching part of the body. Helps clear your sinuses. To clear your sinuses, take a mixture of 1 teaspoon each of fresh ginger juice and honey two or three times a day. Cures toothache. Make a paste of honey and cinnamon and apply on the aching tooth. Moisturizes skin. Mix a dollop of honey and two tablespoons of warm water and massage the mixture into your skin. Helps with tension headaches. Simply sip on a 12 glass of warm water with a couple of added teaspoons of honey. Helps with pink eye. Place a teaspoon of honey with a cup of water and heat just enough to melt the honey. Let cool and use an eye dropper drop the mixture in the infected eye. Leg cramps. Take 2 tbsp. of apple cider vinegar and 1 tbsp. of honey each evening before bed. Reduces cholesterol. Mix two tablespoons of honey and three tablespoons of cinnamon in 16 ounces of tea. Helps with bad breath. Mix one teaspoon of honey and cinnamon in hot water. But make sure to buy raw honey, organic because the heating during manufacturing destroys nutrients and enzymes. Additionally, locally grown raw honey from the area you live is more beneficial as it possesses the immune stimulating properties needed for your body to adapt to its environment. The best part about it, you dont have to sacrifice the taste of sweetness by using sugar substitutes, but can actually enjoy eating what you like and be healthy at the same time!!! Cook 1 cup basil leaves in boiling water 15 seconds; drain. Plunge basil into ice water; drain and pat dry. Combine basil and broth in a blender; process until smooth. Let mixture stand 2 hours at room temperature. Strain through a fine sieve into a bowl; discard solids. Add vinegar and salt, stirring with a whisk. Arrange yellow and red tomato slices alternately on a large platter. Drizzle with basil sauce; sprinkle with cheese and pepper. Top with 1/2 cup sliced basil. Serve immediately. Drizzle salmon with olive oil, and sprinkle with salt and pepper. Set aside 10 minutes to absorb flavor. Meanwhile, combine basil, 1/2 cup olive oil, and remaining ingredients in a food processor. Pulse until finely chopped, and set aside. Heat a large nonstick skillet over medium-high heat. Sauté salmon 4 to 5 minutes on each side, or until desired degree of doneness. Place on serving plates. In the warm skillet, heat reserved basil sauce, and pour over salmon. Perfect Pairing: California lifestyle expert Susie Coelho recommends Meridian Pinot Noir for the Salmon with Basil Sauce. A hint of lemon means the recipe would work equally well with Meridian’s Chardonnay. Another option is Meridian Sauvignon Blanc. Its bright, sunny quality matches the acidity of the tomatoes. It is not surprising as to why the Greeks refer to basil as the ‘king of the herbs’ since it has both culinary value and medical uses. Native to India, basil is used as a cooking staple in dishes all around the world, particularly in the Italian cuisine. It is also widely used in Southeast Asian countries like Indonesia, Taiwan, and Vietnam. Generally, basil is used fresh and added at the last moment of cooking, because it destroys the flavor of the herb. Drying the herb also makes it lose its flavor and aroma, which is why fresh basil can only be stored for a short time in the refrigerator. The flower buds are edible and are also used to give flavor to dishes in place of the leaves. In addition to its culinary applications, basil has numerous health benefits that range from promoting mental health to preventing bacterial infections. Here are 15 reasons why you should consider planting basil in your garden and start incorporating it into your diet. Basil is believed to combat the onset of depression by acting on the adrenal cortex and stimulating the production of cortisol, the hormones responsible for fighting stress. Drinking it as a tea or chewing on the leaves can greatly uplift your mood and decrease your risks of experiencing depression. The abundance of essential oils in basil contributes to its excellent anti-inflammatory and anti-bacterial properties, making it an effective treatment for wounds and skin infections. 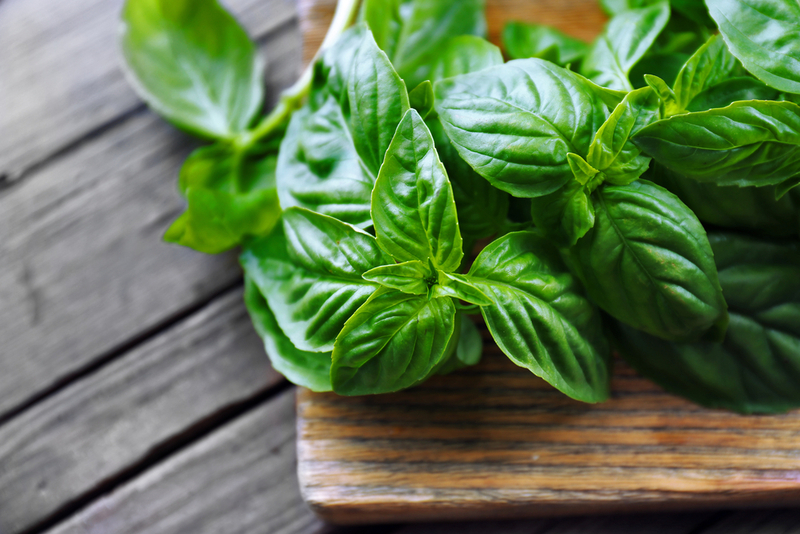 The essential oils citral, citronellol, linalool, terpineol, and eugenol are all chemical components of basil that can kill infection-causing bacteria. 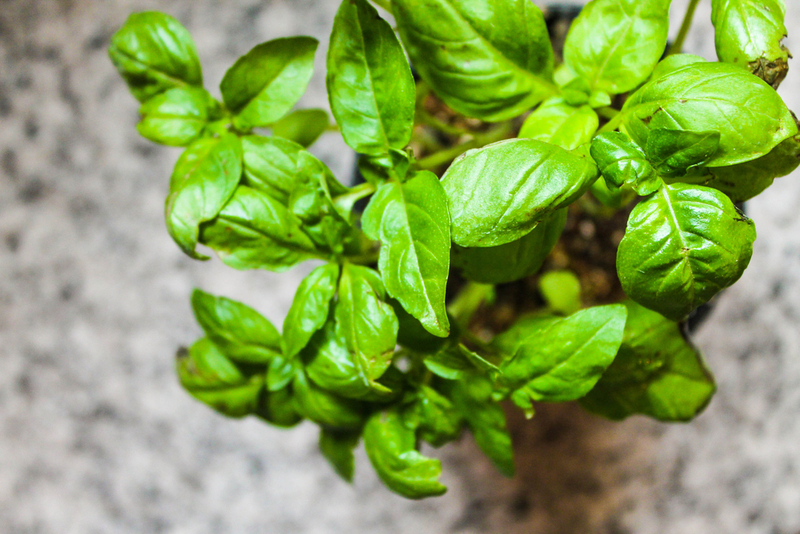 When it is steeped and made into a hot tea, basil can effectively relieve cough, asthma, and bronchitis. It is also used as an expectorant, which enhances the expulsion of phlegm from the air passages of the lungs. Basil is a rich source of iron, and a healthy diet that regularly includes basil will reduce the risk of having anemia, a deficiency of hemoglobin in the blood. Eating iron-rich food helps the blood enhance its oxygen-carrying capacity, thus preventing weakness and fatigue. Zeaxanthin, a carotenoid compound, is responsible for filtering harmful UV rays from reaching the retina of the eyes. Since basil contains zeaxanthin, it can help protect the eyes from diseases such as age-related macular disease (ARMD), a common eye problem among the elderly. The vitamin K found in basil is important in the production of clotting factors in the blood, as well as in building strong bones. Basil contains plenty of minerals that are needed by the body, such as manganese, copper, magnesium, and potassium. Potassium is an essential component of body fluids, which helps regulate blood pressure and control normal heart rate. A teaspoon of basil juice can soothe the redness and itchiness caused by insect bites. Rub the juice generously on the affected area to reduce swelling and discomfort. Due to its anti-bacterial properties, an herbal toothpaste made primarily from basil can kill the odor-causing bacteria in the mouth. The leaves can be ground into a powder and mixed with mustard oil, then massaged on the gums to prevent bad breath and other dental problems. The strong and pungent aroma of basil is believed to promote libido and arousal by increasing blood flow and stimulating the production of hormones responsible for happiness and energy. The flavonoids orientin and vicenin are known to be good antioxidants found in basil. It inhibits the formation of free radicals in the body and protects against radiation injury. The steam of basil leaves is said to cure mild headaches, as the aroma can calm the nerves, relieve pain, and reduce swelling. To do this, add a couple of basil leaves in a pot of water, bring to a boil, and inhale the steam for a few minutes until your headache subside. Basil can also calm an upset stomach and treat bowel disorders. The beta-caryophyllene found in basil can effectively cure indigestion, relieve stomach spasms, and expel intestinal gas. There are plenty of reasons that cause breakouts on the face: sudden hormonal changes, lack of sleep, and excessive sebum production. Whatever the reason may be, applying agel containing basil and orange essential oils on the affected area can clear up the skin from acne. An aromatherapy with basil, sandy everlasting, and peppermint oils is said to improve mental alertness, focus, and attention to people who have been experiencing feelings of mental exhaustion. Basil is safe when consumed as a food in moderate amounts, and as a short-term medicine in adults. However, it may cause low blood sugar in some people. The shoots of the basil should not be taken as a long-term medicine since it contains the chemical estragole. In a laboratory study of estragole, the chemical caused liver cancer to the mice used in the experiment. For pregnant and breastfeeding women, basil is safe when consumed as a food in moderate amounts. For children, basil is safe when consumed as a food in moderate amounts, but should not be taken as a long-term medicine. 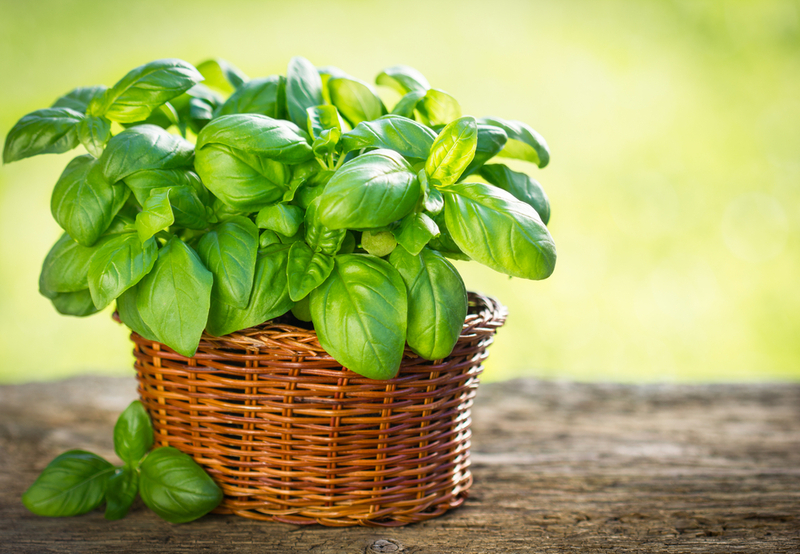 For people with low blood pressure, consuming basil might lower the blood pressure even more. Thus, extreme precaution should be exercised when consuming basil for people with this condition. In the Jewish folklore, it suggests that basil adds strength during fasting periods. European lore claims that basil is the symbol of Satan, while a French physician said that smelling basil too much would breed scorpions in the brain. Certain regions in Mexico believed that basil draws fortune to their business. Shopkeepers would hang a bunch of basil by the window, and its growth would reflect how the business would prosper. Losing weight is a journey, a confusing one at that. End the confusion with these myth-busting tips from Shape! 1. Going vegan is a healthy way to lose weight. “While various research shows that vegetarians and vegans, on average, consume fewer calories and less fat than omnivores (a 2009 Oxford study found that vegetarians weigh 3 to 20 percent less than their meat-eating counterparts, and a National Cancer Institute study found that subjects who consumed four ounces or more of red meat weekly were 30 percent more likely to die of any cause than those who ate less), these numbers may be misleading,” says Rania Batayneh, MPH, a certified nutritionist and owner of Essential Nutrition for You. Going vegan solely for weight loss can backfire, big time. If you aren’t vigilant with a vegan diet, it’s easy to lack in vital nutrients, vitamins, and proteins, which give you energy and help keep your metabolism stoked. Many first-time vegans may also find themselves reaching for more processed foods like vegan cookies, chips, or even ‘ice cream’ more often with such a restricted diet, and many end up packing on the pounds instead. 2. Cut all carbs to shed pounds. Your body needs ‘carbs’ for energy, and many carbohydrate foods are rich in essential vitamins, nutrients, and dietary fiber that help you stay full and fuel your workouts. “Eliminating carbohydrates not only reduces whole grains, B vitamins, and a good source of fiber, but it also reduces your body’s feel-good capacity (it’s no wonder that most comfort foods are carbohydrate based),” Batayneh says. Stay healthy, full, and happy while dropping the lbs. by swapping out processed carbs for fiber- and nutrition-filled foods like vegetables, fruits, and whole grains. 3. Diet drinks are a good way to cut calories. Case in point: One University of Texas study found that people who drink diet soda regularly (more than two per day) had a 70 percent greater waist circumference than those that don’t. Not to mention, diet sodas are also often loaded with additives, including caramel coloring, which is made by reacting sugars with ammonia and sulfites, resulting in two compounds that have been found to cause lung, liver, and thyroid cancers in mice, Batayneh says. 4. Fat-free snacks are better for your waistline. Your body needs fat to absorb vitamins, and it may also help you shed pounds — a recent Stanford University study found that people on a moderate-fat diet lost twice as much weight as subjects eating a low fat diet. So skip the highly processed, fat-free snacks that are basically empty calories and fill up on healthy, whole foods that will help you stay satisfied on a lower-calorie diet such as avocados, nuts, and coconuts. See seven more weight-loss tips after the break! 5. Fruit has too much sugar to be healthy for weight loss. With all the sugar that is added to processed foods, the sugar in fruit is the least of your worries. Getting rid of fruit means you are losing out on valuable vitamins and nutrients that your body absorbs easily since they’re found in their natural, whole state. “Eliminating fruit from your diet when trying to lose weight makes no sense,” Batayneh says. You’ll miss out on a whole lot of filling fiber, which studies have directly linked to long-term weight loss, and you may be more likely to reach for other processed, empty food items instead. 6. Protein shakes will help you lose weight. Drinking protein shakes alone can’t help you lose weight, but replacing a meal with them could. The trouble is, many would-be dieters make the mistake of adding in a shake to their current daily intake, which can pack on the pounds (this is why bodybuilders trying to gain size use them often). If you want to add protein shakes to your diet, look for a mix that is low in sugar and has a short ingredient list. Depending on the calorie count, and what you add to it (Batayneh recommends whey protein, milk, and fruit), you can substitute a shake for a snack or a meal to help move the scale down, not up. 7. A high-protein diet is the best way to shed fat. While protein is important for weight loss, eliminating other food groups (like carbs) for the sake of eating more protein could be setting you up for a carbo-loading binge later. Plus, you may be missing out on the fiber, vitamins, and minerals found in unprocessed carbohydrates, and you run the risk of eating too much fat in your diet, which can lead to high cholesterol and triglycerides, Batayneh says. 8. Swear off all your favorite fattening foods to lose weight. Anyone who has ever sworn off pizza, chocolate, or chips knows that as soon as you tell yourself you can’t have them, you start dreaming of swimming in gooey, cheesy pizza or rich, dark chocolate cake. “Moderation is key. We tend to be in ‘all or nothing’ mode when we diet. And while you can’t have pizza, french fries, and chocolate cake all in the same day, with careful planning, you can still enjoy them in moderation,” Batayneh says. Have your cake, and eat it too — just share it with a friend or save the other half for another day. 9. Eating after 8 p.m. makes you fat. Eating after a certain hour won’t necessarily mean you’ll pack on pounds, just as staying out after midnight won’t turn you into a pumpkin. This Cinderella-esque fat fairy tale continues to exist, but the bottom line is that your metabolism doesn’t know what time it is, Batayneh says. Skip the mad rush to consume as much food as you can before the clock strikes 8:00. 10. You’ll burn more fat if you don’t eat before a workout. Exercise normally burns away your glycogen (carbohydrate) reserves, and when you’re done burning those, you’ll start dipping into your fat stores for energy. It’s true that when you’re already running on empty, you burn fat right away, but you’ll likely run out of steam before your workout is over or end up ravenous and grabbing whatever food you can find in an attempt to refuel afterwards, Batayneh says. 11. You can eat whatever you want on weekends. If you do the math, eating ‘whatever you want’ Friday-Sunday adds up to 12 days, or almost half of a 30-day month! Not exactly the recipe for weight loss success. “When you throw caution to the wind on the weekends it can actually offset the consistency and success you had all week,” Batayneh says. Instead of taking a no-holds-barred approach to your weekends, Batayneh recommends trying to scale back the little things that really add up like the bread basket and having a few extra glasses of wine during dinners out, along with mindless munching out of boredom. The Greatest Fitness Tips. Ever. Our all-time best fitness advice, all in one place. Three decades ago, endurance training consisted of pretty much one workout: all-out, all the time. Then fitness went mainstream, CEOs started wearing spandex, and “sports scientist” became a legitimate career goal. The result? Periodization, VO2 max, functional strength, and more. Herewith, a highly concentrated dose of Outside training advice distilled from 30 years of health-and-fitness expertise. Embrace daily rituals, whether it’s making coffee just so or walking the dog. Routines can lower blood pressure and slow heart rate. “The Kenyan runners who always win marathons never jog,” says pro soccer player LANDON DONOVAN. So Donovan trains at 80 percent of his maximum heart rate until he’s exhausted, teaching his body “recovery endurance” through a sequence of sprints and rests. Over time, you’ll still need to give your body a break to optimize gains (see Train with a Plan, below), but this ability to push yourself to the brink of collapse and recover quickly is essential for top aerobic athletes. With a heart-rate monitor on, run or cycle on a flat course as fast as you can for 30 minutes. Your LT is your average heart rate for that period. Here’s how to reach peak shape for any sport with one 12-week program. FIRST MONTH: Complete a full-body weight-lifting circuit twice weekly. Do your cardio workouts on three other days, going long once. Each week, increase the duration of the long day’s workout by 10 percent. During the fourth week, cut the workout load by 50 percent. SECOND MONTH: Follow the first month’s plan, but cut back to lifting once a week and add another day of cardio. During the eighth week, which is for recovery, cut everything in half. THIRD MONTH: Stop lifting and use that day for cross-training. Ramp up speed by completing one cardio day each week with intervals at your intended race pace. Your long cardio day remains the same for the first two weeks, and for weeks 11 and 12 you cut its duration in half. During week 12, taper by doing only 50 percent of week 11’s work. Lift. Lower weights slowly. It helps train your muscles to absorb shock and control your descent in real-world action. Hydrate. For workouts lasting one hour or less, drink only water. For longer outings, bring a sports drink with carbs. Relax. Don’t try to make up for missed workouts by doing two long days back to back. If you miss a day, just let it go. “A competition is just to show off how hard you’ve been playing,” says freestyle kayaking champ ERIC JACKSON, who credits the fun factor for his success. You’re not slacking off; you’re recovering. Take two days off each week, an easy week every month, and a month of active rest—like surfing or riding a cruiser—per year. Runners: Cycling maintains leg strength and cardio fitness while giving you a break from impact on your joints. Cyclists: Running and rowing develop strength in the torso, quads, and glutes. Climbers: Calisthenics use body-weight resistance to build strength without adding bulk. Swimmers: Rowing builds key strength in the shoulders, arms, legs, and torso. Kayakers: Swimming works the arms, shoulders, and torso, improving power and range of motion. Bones weaken if you do only low-impact activities. Strengthen your skeleton by mixing in high-impact workouts like running, jumping rope, or playing ball sports. A weak trunk can cause chronic back pain and other torso problems. The prevention: crunches and planks (brace yourself on forearms and toes, body rigid like a plank). “When you sit down on an exercise machine, with your back against a chair, you tend to shut down the rest of your body,” warns LAIRD HAMILTON. “You want strength that you can actually control and apply.” It’s called functional strength, and it dictates the way you should lift weights. Here’s our complete workout. Do Group 1 once a week. Two days later, do Group 2. Concentrate on smooth, controlled lifts throughout. Unless you’re winning prize money, allow six months between marathons or Ironman triathlons. It will help you avoid overtraining during intervals. Use a two-to-one work-to-recovery ratio. Let’s say your intervals last two minutes each. After the first one, recover for one minute and check your heart rate. The first time your heart rate fails to drop to this number on subsequent intervals, you’re done. OK, the scorpion pose is a joke. But daily yoga or stretching improves flexibility and muscle endurance. Mental fitness can be just as important as the physical sort. Surfer KELLY SLATER says his record seventh world title was due largely to the personal growth he achieved from healing strained family relationships. “I’m relaxed as I’ve ever been,” he said prior to winning. Skimping on sleep triggers a decrease in human growth hormone (HGH), which can cause muscles to wither and fat to build up. It’s crucial for everyone to get a full eight hours of sleep each night, and you can use an afternoon nap to reach that eight-hour goal. Exercise five days a week. Get antioxidants from whole foods, not supplements. Wash hands frequently and thoroughly. Straighten up. Balance, coordination, and flexibility all begin with good posture. When standing erect, you should be able to draw a line from your ear to your heel, with the line bisecting your shoulder, passing through your hip, and grazing the back of your knee. IBUPROFEN and aspirin for sore muscles. ACETAMINOPHEN (Tylenol) for pain from viral illnesses (colds, flu) and injuries involving bleeding. COLD TABLETS containing pseudoephedrine to clear up sinus congestion without causing drowsiness. ANTIBACTERIAL SOAP and hydrogen peroxide for cleaning wounds. SHOT GLASS, in case none of the above works. Lift weights to build muscle. This raises your resting metabolic rate, the energy you burn to keep your body (and muscles) alive. Eat often, approximately every three hours. Eating frequent, small meals is linked with lower body-fat percentage. Avoid calorie-dense foods, like sweets and dried fruits. Eat more foods with high levels of water and fiber, like raw vegetables and whole grains.